Much of what a magician does is misdirection, which is the art of getting people to look elsewhere while you are cheating. They even have one in Milton Keynes and the youngsters who attend are taught music, stage, film and TV acting by a team of very good tutors. I was brought in to explain magic - and possibly even more importantly - the technique of its presentation. It involves misdirection, which is the art of getting people to look elsewhere while you are cheating. Actually, as I point out to the students, you can often get away with the most outrageous moves right in front of the audience as you're nattering away to them, by holding their attention and eye contact. "So the quandary about magic is this: Why am I happy to give away the secrets?" That's not quite right. I wouldn't give away the secrets of someone like Dynamo, even though I know how he does most of his illusions. It's not for me to do so. I guess someone on YouTube will be doing that anyway. In fact, all I do is teach the basics of the magic tricks I do, most of which involves making things disappear (or suddenly appear), card moves made easy, how to push swords through people's necks and make things burst into flames. I always carry around my Tommy Cooper Bottles and his Educated Duck; both tricks are not terribly hard to work out, but are amazingly funny and people just enjoy them. "So what I'm passing on to these young performers is the ability to entertain people using magic." 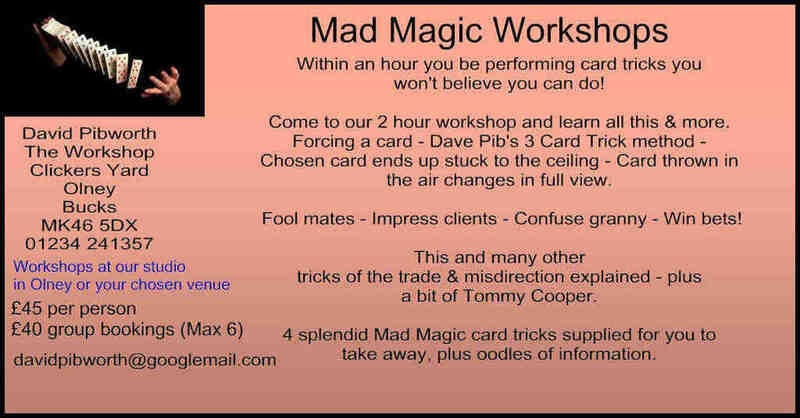 Anyone can do the magic tricks themselves and I run a very successful two-hour workshop in Olney where you can learn a lot of stuff (and go away being able to perform immediately), but you need to sell them to the audience, which is the tricky bit, as they all need rehearsal in front of a mirror. Boldness is the key to it really, and a belief that most people won't have a clue how you do magic, and those that do usually come up and have a chat afterwards in order to swap ideas. Which is exactly what I do when I see a good magician at work. "Another good argument is that if some of us didn't teach it, who would be left to do it when we are all dead and gone?" If I was the last person to throw a pack of cards at a window and your chosen card, which you have just put back into the pack, ends up on the other side of the window, it would be a sad old world. I want others to be able to do it, in their own way. I make no claim to being as good as Tommy Cooper or Eric Morecambe, but I am trying to be instrumental in inspiring young people to be the next Tommy Cooper or Eric Morecambe. I help them to understand what entertainment is and, by watching old entertainers on TV repeats and taking tips (nicking ideas) from them, they can devise their own shows. And that often starts with them entertaining the family at Christmas with a trick like the one above, which I also nicked. Yep, I can teach you how to get a chosen card stuck on the ceiling in about 5 minutes. So, carry on entertaining please, otherwise you could end up wasting your life by being on endless committees and trying to change the world. And that isn't a career for interesting people like yourselves, is it?